When the first El Nino rainstorms rumbled through Southern California followed by cold temperatures, crumbling roadways began to emerge. A new study from AAA reveals that pothole damage has cost U.S. drivers $15 billion in vehicle repairs over the last five years, or approximately $3 billion annually. With two-thirds of Americans concerned about potholes on local roadways, AAA cautions drivers to remain alert to avoid pothole damage, and urges state and local governments to fully fund and prioritize road maintenance to reduce vehicle damage, repair costs and driver frustration. According to AAA’s survey, middle- and lower-income individuals are the most worried about potholes, with the majority of respondents in households having annual incomes under $75,000 expressing the highest levels of concern over damaged roadways. 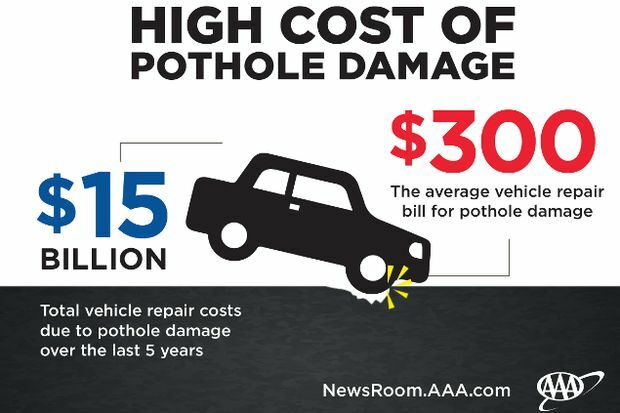 This is likely due in part to the financial impact, as pothole damage can lead to expensive and extensive vehicle repairs. About 57 percent of drivers in the West said they are concerned about potholes on local roadways. AAA’s members are paying a steep price for bad road conditions, and those costs are expected to rise even higher in the years ahead. Americans rely on our nation’s roads and bridges every day, and more funding is desperately needed to prevent potholes, other unsafe conditions and longer commutes. Congress increased transportation funding in 2015 to help pay for road repair, but as much as $170 billion in additional funding is needed per year to significantly improve America’s roads and bridges. California can take the next step by ensuring that all motorist and highway user taxes and fees go to needed road repairs and improvements, which is not the case today. “Hitting even one severe pothole could alter the alignment of a wheel from suspension damage resulting in uneven tire wear. Uneven and premature tire wear means the tire will need replacement sooner than necessary and can increase fuel consumption at needless expense,” said Skaien. “A broken shock or strut from hitting a pothole could alter the steering and handling of a vehicle, and create dangers when driving at higher speeds or in tight corners,” Skaien said. Motorists who suspect their vehicle’s suspension components were damaged or broken by a pothole should have their vehicle towed to a high-quality repair facility such as a AAA Approved Auto Repair facility where it can be inspected and serviced, if necessary, the Auto Club recommends. There are more than 7,500 AAA AAR facilities in North America. Information about the more than 400 Southern California AAA-Approved shops can be located at www.AAA.com or by calling your local AAA branch. AAA members receive unique benefits, including priority service, a 24-month/24,000-mile warranty, special discounts, free inspections, dispute resolution assistance and more.